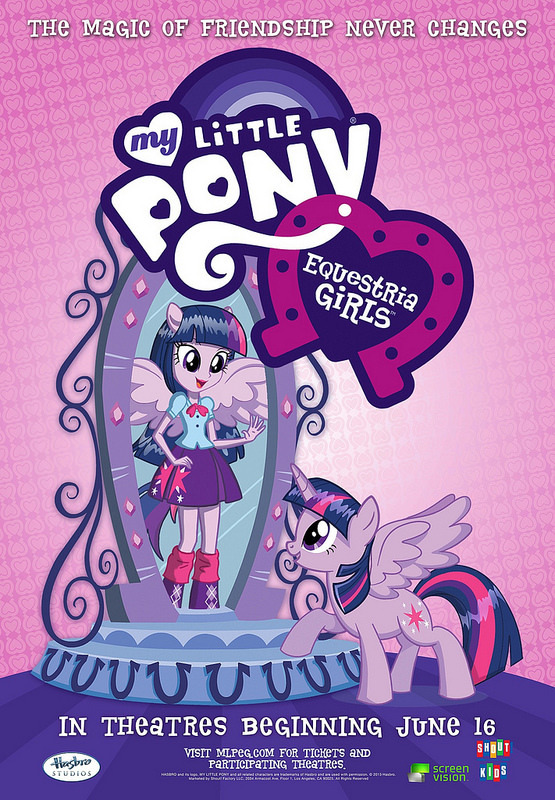 I’ve been a casual big My Little Pony fan for ages now, but I had yet to get into the Equestria Girls part of the franchise. When I saw that my library had ordered this comic I knew it was time to jump in. It’s a pretty fun spinoff from the main series. 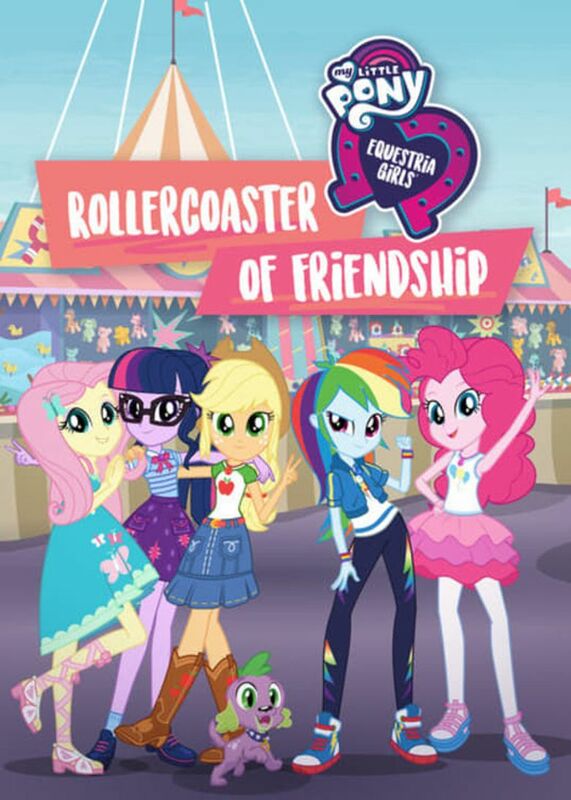 I definitely prefer the main title as you can argue that the whole point of My Little Pony is seeing the ponies show us values of friendship and harmony which we can then apply to everyday life. Seeing fellow humans use these messages can still be effective, but it loses the extra intensity that the main comics have since there are no dark overlords trying to murder everybody here. There are really two main comics here. The first one deals with how the main characters met up and became friends in the first place. All of the ponies get a lot of screen time here, but Rarity may have looked the worst. So, Applejack has moved to the school and is hoping to make friends. Unfortunately her mean cousin is around and takes it upon herself to bully Applejack. Applejack tries her best to fit in with the “cool” crowd, but they won’t have any of it. Fortunately, Pinkie Pie has a plan to make everyone smile by cheering at the local soccer game. Rainbow Dash is too busy winning awards and stomping people into the dirt to help Applejack. Usually this is where Rarity would step up, but she enjoys the attention and decides to turn a blind eye to the bullies. Fluttershy would speak up, but she’s a little too intimidated by all of the other characters at the moment. So, here’s why Rarity is probably the worst character of the story. She basically just ignores Applejack’s plight the whole time which felt a little out of character. Maybe it was the only way that the writers could get the story across, but it still felt a little iffy to be honest. She made the right call in the end though so I suppose that’s what counts. Rainbow Dash was probably the best character this time. Sure, she may have been a little overconfident, but lets face it, that’s why she’s such a great character. While the rest of the characters were getting messed up by the drama, Rainbow Dash was focusing on the win. Fluttershy was…Fluttershy. She was a little too nervous to confront the bullies, but at least she let them know that the dog was sick. That was definitely a good move. She’s a nice character, I just wish Fluttershy would put the others in their place a little more. Especially when they started subtly insulting her by calling her names like Flustershy or Flutterbye. She does quite a bit of crying in the story but it also shows that she has heart! It’s always nice to see the characters meet up though so this was a great way to start the comic. I’m assuming they all know each other already in the movie then or this is some kind of alternate retelling of the origin. The bullies got put in their place, but surprisingly I don’t recall them being truly converted. I’ll assume that they turned good off screen since the heroes never leave anyone behind. They must all embrace friendship at some point. The second tale is about the main characters hanging out with Sunset. She was shunned in Pony world and escaped to the human one so she can finally have some friends. (I’m pretending that I don’t know what happened in the main series. If you just read from this comic, this is the vibe you get) Twilight Sparkle has essentially banished Sunset to the human world so she can be a better person and must keep up a diary chronicling what happens each day. Sunset hasn’t gotten to enjoy the holidays since she had no friends, but Applejack and friends decide to help her out. After an intense Avengers esque scene where all of the friends are brought in to help with the party, they invite Sunset over. The party goes great, but then pictures of it start leaking out to the school and Applejack suspects that Sunset is guilty. Sunset pleads her case, but the main six will hear none of it. They are now getting bullied by the entire school and blame Sunset for it. Meanwhile Sunset is friendless once again, but has decided that she’s going to solve this case. As you can probably guess, Sunset didn’t sell out her friends. Honestly that would have been quite the plot twist, but it’s probably a good thing that the comic didn’t go there. It may have been hard to have been a Sunset fan after something like that. She’s a pretty fun character and it’s cool to have one of the humans actually be a Pony. It seems like everyone knows, but she still tries to act like a human anyway as she quickly stops herself from saying phrases like “Everypony.” I’d probably just keep using it personally since it’s pretty unique and all, but I guess whatever works. The rest of the main characters didn’t look quite as good this time around. They were a little quick to doubt one of their friends and Sunset’s denial should have been enough for them. Rainbow Dash’s battle against Fluttershy in the video game was pretty intense and I’m glad that Dash took the win. It was nice that Fluttershy was a little more pro-active in the game though and really got into it. The characters have definitely been through a lot by now so I’d expect some character development. I could also sympathize with the villain of this story a bit since once again, Rarity was being a little iffy. The villain was clearly getting along pretty well with her friends so they could have let her stick around. I don’t think she would have gotten in the way or anything. The villain still made the wrong move, but at least it also reminded Rarity of an important message. I kind of wish they would have a letter at the end explaining the message for those who didn’t get it, but it’s clear enough so that shouldn’t be a problem. As far as the art goes, it’s not amazing, but it’s pretty good. The character designs are all on point and the only part that is a little iffy are the tears. They end up creating large puddles which can be a bit much. The scenes of the characters all crying and still fighting each other were also intense. The best panel in the comic is definitely when Rainbow Dash tripped someone up and then jumped on his head as she passed him in the soccer game. A bit brutal sure, but this is Rainbow Dash we’re talking about. She’s always ready to go for the win. The writing is also pretty solid. The whole point of the series is its 5 star writing after all so it doesn’t disappoint here. As mentioned earlier, my only gripe is that the Main 6 doubted Sunset a little too easily, but it does help you sympathize with her. It feels like everyone is always doubting her because of her past and it shows that even the main characters aren’t exempt from that. Still, she’ll stick around as one of the heroes and eventually they’ll all really accept her. Now, there is one huge plot hole here that I have to address. Don’t be alarmed but I picked up on this instantly. (Humble brag) There is one scene where Rarity orders 16 pizza pies, but the stack looked a little too large so I decided to count them all. There were 17 pies that the character was holding. Where did the extra one come from? The quality checkers slacked off on that one a bit to be honest. It happens to the best of us though right? Overall, This was a fun comic. Rainbow Dash was the MVP with Sunset being the runner up so Pinkie Pie lost out for a change, but she got a small role this time around. 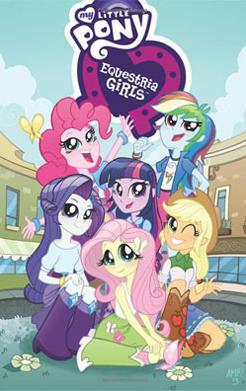 It’s too bad that Equestria Girls didn’t get its own ongoing like the main My Little Pony series. I’m sure that there are a bunch of stories that you can tell in this setting. Still, the main title is the one that I’m the most interested in so hopefully the library can get more volumes soon. If you’re a big fan of the franchise then you’ve gotta check this one out. If you’ve never taken the plunge before, then now’s a good time to start. You’ll be surprised at how much you enjoy My Little Pony during the adventure and one day you’ll be bold enough to call yourself a fan in public. Small steps first.